Ryan Bridges|! !| assistant store manager at the Pheasant Lane Mall in Nashua. 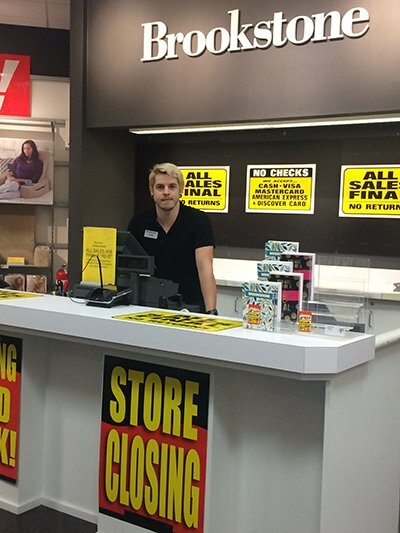 Ryan Bridges saw it coming, but the assistant store manager expected Brookstone to last another holiday season, he explained during a quiet going out-of-business sale at the Pheasant Lane Mall in Nashua. There were would-be customers in the de facto showcase store — the closest to the company’s Merrimack headquarters — eyeing the football Bluetooth speaker or relaxing in a massage chair, but none seemed to make it to the cash register. And in the last few years, fewer people were even looking, Bridges said. Brookstone, which was started as a catalog company in 1965 via a Popular Mechanics advertisement before moving its operations to Peterborough, NH, in 1969, eventually morphed into a mostly brick-and-mortar retailer, with hundreds of mall stores. Indeed, it mainly blamed slow mall traffic for its Aug. 2 Chapter 11 bankruptcy filing, its second such filing in federal bankruptcy court in Delaware. Brookstone plans to close all 102 of its unprofitable mall stores — including the one in Nashua and its only outlet store in Conway — and sell off the rest of the company as a going concern, all by the end of September. The reorganization was necessary to protect the brand and salvage the company’s other assets — its 37 airport stores, its online business and sales of Brookstone products in other retail outlets, the company explains in the filing. But the company is trying to keep the brand alive for another reason: the continuation of some 550 Brookstone stores and outlets in China, primarily owned directly by Sanpower Group Co. Ltd., headquartered in Nanjing, China. Sanpower is Brookstone’s owner, its primary supplier, its largest creditor and its savior until it finally pulled the plug, forcing the bankruptcy filing. Sanpower is much bigger than Spencer, with about $20 billion in sales and more than 100 subsidiaries, including the House of Fraser, another troubled retailer, in England. Indeed, a third of the company’s 120,000 employees work outside the home country, but Brookstone was Sanpower’s first venture in the United States. Brookstone China opened its first store in Nanjing, Sanpower’s home city, in January 2016. It now “operates over 550 stores throughout China that are branded under the Brookstone name, or are co-branded with other retailers that sell similar products in China,” according to a declaration filed by Greg Tribou, Brookstone’s chief financial officer. But the Brookstone entities filing for bankruptcy only see a tenth of that revenue, since the Chinese joint venture that owns it — Brookstone Electronics Co. Ltd. (which is not filing for bankruptcy) — is 90 percent owned by Sanpower. But in the United States, Brookstone has lost tens of millions of dollars every year since Sanpower bought it. It lost $60 million in 2017 alone, Tribou said. Indeed, one of the company’s biggest assets was that it lost so much money: $262.4 million to be exact, which could translate into a nice $55.1 million net operating loss credit against future earnings. Revenues have plummeted. In 2014, sales were at $420 million, down from its peak of $563 million in 2007. By 2017, revenues totaled $264 million, and in the first half of 2018 only $75 million. Mall stores, which account for 52 percent of 2017 revenue, contributed $30 million to the annual loss. The airport stores, accounting for 15 percent of revenue, made money, but only $1.4 million. Online sales accounted for 21 percent of revenue, but it was “an add-on to retail,” explained a Brookstone attorney during the company’s first bankruptcy hearing. That aspect of the business lost $1 million last year. In addition to Brookstone’s small share of the joint venture in China, it also made some money on a 3 percent licensing agreement via various sub brands, such as Big Blue Audio, Nap and Thera Spa, but Tribou did not break out Brookstone’s China income. Tribou didn’t go into detail, but he did say Brookstone lost some vendors when payment terms went from 10 to 60 days and it insisted on getting paid in Chinese yuan as opposed to U.S. dollars. He also suggested that the difficulties might be solved via the bankruptcy filing, perhaps by wiping out $50 million of unsecured trade debt. But most of those difficulties are with Sanpower, or rather another subsidiary, Sanpower Sourcing Group SSG, because SSG supplies nearly half of Brookstone’s products. Brookstone became more dependent on SSG during the fall of last year, when it severed a 20-year relationship with another major supplier, Asia Combine Company Ltd., according to a lawsuit that the Hong Kong company brought against Brookstone in April in U.S. District Court in Concord. SSG, the complaint noted, was “the company directly or indirectly owned and/or controlled by Brookstone’s owner, the Sanpower Group.” The termination left the company with about $20 million in orders in anticipation of the holiday season rush, in which they expected to earn a 5 percent commission, or $1 million. Brookstone already owed $543,000 in commissions from previous orders. Brookstone denies that it owes that commission on the $20 million of anticipated sales. It did own up to the older debt, but denied that it was “substantial” and said it was on a year-long payment schedule starting in January. However, the bankruptcy filing lists an Asia Combine claim of $453,000, indicating that only a few payments had been made by August. Only SZ Telstar Co. Ltd., a Shenzhen electronics manufacturer, had higher claims, $827,000. The largest U.S.-based creditors are Shokz LLC, a Syracuse, N.Y.-based Bluetooth headphone provider ($474,000) and Simon Properties, owner of the Pheasant Lane Mall and many others around the country ($779,000). But SSG’s $39.3 million debt dwarfs them all. It amounts to nearly half of all unsecured debt. Sanpower also has a secured debt claim of $46 million. That’s because of a series of advances to Brookstone in 2016. When Sanpower announced in July it would stop advancing money, the firm prepared for bankruptcy. There are three other creditors with secured debt: Gordon Brothers Finance, owed $15 million on a term loan; Wells Fargo, $13.5 million outstanding on a $70 million revolving line of credit; and Wilmington Trust on a secondary $14.9 million lien. Wilmington’s attorney, who said he only learned of the Sanpower lien via the bankruptcy filing, wants Delaware Bankruptcy Court Judge Brendan Shannon to rule that Wilmington’s came first. Shannon put that decision off, but he did approve Gordon Brothers’ $30 million debtor in possession financing loan to keep Brookstone going. Shannon dismissed concerns by the bankruptcy trustee that the DIP loan might be a “collateral grab” by the lenders to improve their chances of getting paid. The trustee’s office also questioned whether it is necessary to approve the entire DIP financing at the first hearing, since the company only needed a few million dollars to get over the immediate hump. The trustee raised concerns that Gordon Brothers Retail Partners was one of the two firms conducting the going out-of-business sale but a Brookstone bankruptcy attorney told the court that the two Gordon Brothers firms were unaffiliated. The proceeds from the store closings will not be enough to satisfy the company’s large debt, bankruptcy attorneys told the judge. For one, the court offered a bonus to retain employees during the sale, and the company also has to replace those who leave. At a mall store in Myrtle Beach, S.C., the entire staff walked out and did not return, Brookstone told the court it would be cheaper to just abandon it. But at the Pheasant Lane Mall, only two of the five Brookstone employees have left, and a replacement has already been hired for one, said Bridges, the assistant manager. Bridges knows more about Brookstone’s financial situation than most store employees, since he gets some of the scuttlebutt from Merrimack officials he has met who take visitors down to the mall to show off a store. He said he is aware that Brookstone’s parent company opened hundreds of Brookstones in China while closing them in the United States. He isn’t worried about his own fate, given his experience and the state’s unemployment rate. His main concern is for the customers, but they will be able to redeem their gift cards at the airport stores or online. That remains to be seen. But by Aug. 27, it was announced that Authentic Brands Group — a company that has revived several other troubled brands — opened the bidding for Brookstone at $35 million, a stalking horse bid. The plan is to conduct an auction on Sept. 24 and close the sale on Sept. 30, the same day the mall stores are to be closed.